Mark your calenders folks, December 1st 2017 will be when Bandai holds a Tamashii Nations event, the event’s web site was just updated with a collection of logos from various series that will be receiving a major announcement at the event. Amongst those series, the two that are relevant to us are Kamen Rider Den-O and Kamen Rider Black RX. 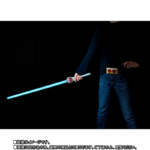 With this year being the anniversary of Kamen Rider Den-O, the announcement of a Seihou Den-O Sword form seems likely. The announcement of an S.H.Figuarts Kotoaro Minami seems very likely as well as a possible Seihou release for Black RX himself. Of course, this is all speculative as nothing has been announcent on an offical level as of yet. None the less, tune back with us on December 1st and we’ll bring up to date info as it becomes available. In the meantime, make the jump and join our speculation discussion! Just in time for the end of the year we have another behemoth Rider Machine to review! Not to be entirely outdone by Kamen Rider Drive’s Tridoron,[/URL] the late Showa classic Kamen Rider Black RX swoops in with this massive release to round out the year. S.H. Figuarts Ridoron! The Ridoron, much like Black RX’s other ally Acrobatter, is a sentient machine that allied itself with RX in the battle against Crisis Empire. The Ridoron figuart is yet another excellent huge addition to the line following in the footsteps of other big releases like Machine Itasha & Tridoron. This one is a very straightforward release with no real accessories aside from the antennae you need to attach. However Ridoron does feature some excellent action features in the form of spring-loaded mandibles in the front bumper and functional turbines in the rear! S.H. Figuarts Ridoron is another welcome addition to any Kamen Rider Black or Black RX collection. Feel free to check out over 30 images of Ridoron as well as a full review by clicking “Discuss on the TokuNation Forums” at the bottom of this post. 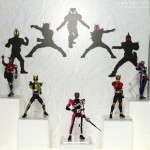 And remember that this gallery qualifies you for entry in our Toku Toy Box Giveaway! That means all you have to do is post something relevant to the conversation and you’re entered for a chance to win! After a long wait magazine scans from Figure Oh have finally confirmed release details for S.H. Figuarts Rideron! The first non-bike vehicle used by a rider, Rideron dates back to 1988’s Kamen Rider Black RX. We didn’t see another true car for a rider until the current Kamen Rider Drive began. And it’s the release of S.H. 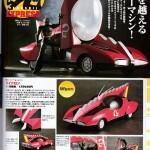 Figuarts Tridoron for Drive that’s finally made Rideron’s release possible! And what’s the even better news you might ask? Rideron will be a retail release! Shockingly it is NOT a web exclusive! However as with Tridoron, S.H. 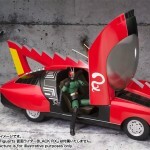 Figuarts Rideron will be rather pricey at 19440 yen, and is scheduled for November release. 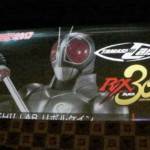 New SuperHero Taisen GP Images Online- Featuring Rider Grand Prix! Several new images from the upcoming crossover film SuperHero Taisen GP have been posted online! These images give us a close look at the Kamen Rider Grand Prix– a race between ten powerful Kamen Rider vehicles! In addition, we also get a quick glimpse at the next upgrade for Kamen Rider Drive: the Ride Boosters! A pair of red & blue go-karts are equipped to Tridoron, unlocking extra speed and flight capabilities. SuperHero Taisen GP premieres in theaters on March 21st! Stay tuned to TokuNation as we keep you up to date on all movie details!